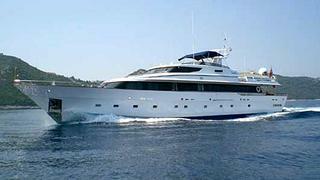 Back in February 2010 I reported the sale of the 35.4m motor yacht Deep Blue and now Cromwell Littlejohn at Merle Wood & Associates tells me he's brought her back to market in a joint listing with Rupert Gregory at Allied Marine. Deep Blue was built by England’s Brooke Marine in 1988 to a Don Shead design and has recently emerged from a multi-million dollar complete refit. Accommodating eight guests in a master, VIP and two twin staterooms, this superyacht cruises at 15 knots with a proven transatlantic capability. Lying in South Florida, Deep Blue is asking $2.5 million.